Cat Crawfield returns in book 7 of the Night Huntress series. This time around Cat and Bones are living their lives together in peace... Of course that doesn't last long before they find out their old team members have been missing for over a week. Cat decides to look into the matter and it leads her to her old job. Since her uncle has passed, she's forced to deal with Madigan. Things don't go well, and she has to play guess where the team is and figure out a way to rescue them all while avoiding traps set by Madigan. I'm so glad I finally decided to finish this series up. JFrost wrapped up everything nicely and it didn't feel rushed. There was even a bit of a whammy which I didn't see coming. I'll miss the characters, but I'm sure I'll re-read the series at some point in the future. Until then I'll go read/listen to Vlad's story. I should have a review for book two in that series up later this week. 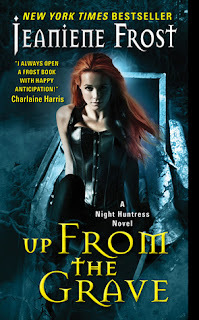 If you haven't read this series yet, I recommend it if you're looking for a strong female lead in a vampire urban fantasy/paranormal romance. I really enjoyed this one and I felt it was also wrapped up nicely. Sad to not have cat and bones anymore, but its been fun seeing them interact with Vlad and Leila's series. I felt the same way. I will miss Cat & Bones, but there are still going to be a few of the spin offs. Did you see her post? Ian is coming!!! Squeee!!! She has to finish Vlad 4 and the New Adult series (I can't remember the series title with Beautiful Ashes), then Ian. She also wants to do a book with the new character that appears in this book, but that will be down the road. I liked this one, better than the 2 last ones. It was a nice end. I think that was partially the reason I didn't want to finish the series. The previous book or two were not my favorites. Glad it ended well though. I think it being an audiobook was the final thing that made me "read" it to be honest. Otherwise it would have sat on my shelf for a long time. This was the only book in the series I didn't like. I hated the twist! Still one of my favorite series.